This is a post that has needed to be written for some time now. If your kid was anxious or being bullied, how would you feel? Probably pretty bad. Your heart would ache, and though you'd be strong for your child, you would be crumpled inside. You would be heartbroken, yes? I would. It is how any loving parent might feel. So why is it when a parent of an autistic child expresses their own pain as a parent, she is vilified? If you are not involved in the online autism community, you are probably confused by this. If you are the parent of an autistic child, you are probably nodding your head. You've heard this argument before. How can you possibly be talking about your own need for support? It is so much harder to be the autistic person. My son's struggles are not mutually exclusive to mine. We can both be hurting, just as we can both be joyous or scared or hopeful or all of the above. I do not deny my son's challenges by recognizing my own. Moe gets frustrated. His communication challenges make things very difficult for him. And when he is frustrated or unable to tell me that he is hurt, or uncomfortable, or bored, or he doesn't understand why I'm asking him to do something, or not letting him have m&ms at 7:00 in the morning, he can get aggressive. He cries, and bangs his head. He scratches me and bites his hand. He is strong and it is scary. Of course I know he's hurting. Of course I know it is hard to be him. I am his mother, and I—as much as is humanly possible—feel his pain. I do not know what it is like to be him, but I see his struggle and I would give anything to make it easier for him. Moe had three stitches in his forehead a few years ago, and, despite the numbing cream, screamed out in pain at each needle poke. I did not feel his physical pain but I will tell you this: if I could have taken that pain instead of him, I would have. It hurt me to my core to hear him scream. I remember that sound perfectly, though Moe has certainly forgotten it by now. This is no different. You are allowed to have feelings. Let's say that again. You are allowed to have feelings. Not just your kid. Not just everyone around you. You. Let's get real for a moment. Raising Moe is really hard. We have no real schooling options. We have made a decision to try some pretty serious medications to help keep Moe from hurting himself and others. I worry about Moe's future and the lack of housing options for him as he grows. And it is really, really heartbreaking and stressful when your child attacks you. And it is even more heartbreaking to see that child hurting his sister, or himself. So you know what? I get to feel those feelings of fear and stress and heartbreak as they exist. They are genuine and legitimate and no one gets to tell me otherwise. Feelings just are. I can control how I react and use those feelings, but I cannot help having them. Why is this important? Why give voice to what might seem a ridiculous discussion to anyone outside of this community? Because these kinds of arguments are tearing apart a community that should be working together. Because when you tell a mother that she shouldn't feel stress or anger or grief, you don't change her feelings, you push those feelings to a place of guilt and shame where they will simmer until they boil over. You deny a father the support and help he needs to be able to put his energy into helping his children. Because ultimately there is no one else. We as parents bear the burden and the joy, the responsibility and the privilege of caring for our kids. And we're doing the best we can. “But that’s impossible!” said little Charlie, staring at his grandfather. I work as a writer for a web company. I also write on my own, sometimes on this blog, and sometimes in a journal (but my journal entries are often like unpolished essays). Very occasionally, I write fiction. It is something I want to do more. For me, fiction is the hardest to write. Creativity with constraints is so much easier. Blog posts are constrained by reality. I try to relay events, or memories or emotions in a way that evokes feeling, but that is still based on my true experience. And reality has its limits. I have worked in Silicon Valley for a long time, and seen a lot of creative ideas. As part of a design team, I think a lot about creativity. How do you evoke new ideas? How do you nurture a creative environment? But even the most entrepreneurial tend to think with constraints: business constraints or computing constraints (maybe even legal constraints). It is very hard for someone to come up with a truly original idea, to think freely without the limits of what is possible. But when we write, we don’t need to worry about those constraints. Don’t have the computing power? Write it down, and now you do. Can’t figure out how your character is going to be in two places at once? Just write it down - you’ll figure it out later. In fiction, your characters can fly, be invisible or go days without eating. They can be everything and nothing, and things we haven’t even thought of yet. It is hard to free your mind in such a way. But when done right, amazing things can happen. This post was inspired by the classic Charlie and the Chocolate Factory by Roald Dahl, which celebrates its 50th anniversary this year. To celebrate, Penguin Young Readers Group, in partnership with Dylan’s Candy Bar, the world-famous candy emporium, and First Book, a nonprofit social enterprise that provides books for children from low-income families, is launching a year-long international celebration. Head over to From Left to Write to learn how you and your child can have a chance to win the Golden Ticket Sweepstakes where the grand prize is a magical trip to New York City plus much more! For every entry submitted, Penguin Young Readers Group will make a donation to First Book. 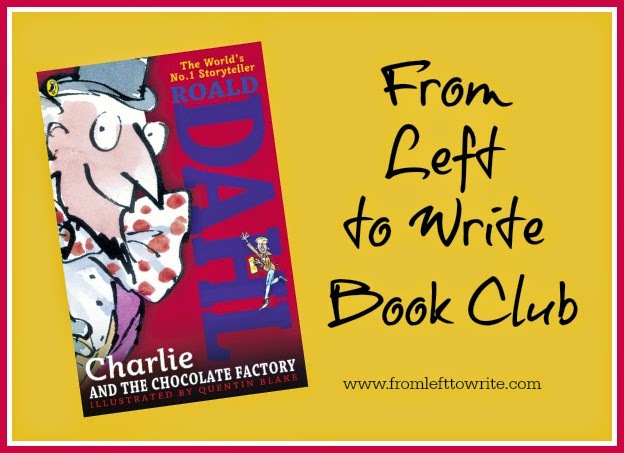 Then, join From Left to Write on July 24 as we discuss Charlie and the Chocolate Factory. As a book club member, I received a copy of the book for review purposes. It's been a while since I've blogged here, a couple of months, at least. But since I'll be attending the BlogHer conference in another week, I thought I should post something, so I can still call myself a blogger. Life is chugging along. Moe had several very rough months. We saw a heightened aggression from him, coupled with some very frightening new self-injurious behaviors. Moe was not only biting himself, but he also started banging his head—hard. We thought it was related to some new molars, but the behaviors continued long after that was done. He gave himself a huge bump in the middle of his forehead. He put his head through the wall. We did everything we could to keep him safe, but when we would stop Moe from banging his head, he got mad and would turn his aggression on us, his nannies and his therapists. Behavioral interventions were not working. So we made the very difficult decision to try a new medication. This is not a decision we took lightly, not only because medications can have serious side effects. Not only because Moe has such difficutly learning and communicating that we need to make sure he is as clear-headed as possible. But also because we've been here before. Last year, we tried Tenex (as well as the related drugs Clonidine and Intuniv). This was disastrous. Behaviors and sleep got worse. I didn't want to get burned again. After several months of trying everything else we could think of, we started a new drug, Risperodone. I don't share this information lightly, as it is, in some sense, very personal information to share. But I share it because I have learned from others' experiences, and I hope others can learn from me. So far, Moe is doing well on the drug. The biggest change is that he is falling asleep on his own, and staying asleep. We are no longer using melatonin, which seemed to make Moe really unhappy anyway. This, in and of itself, is an enormous benefit for the entire family. Jelly is also back to sleeping through the night. She, like Jeff and I, had become accustomed to 3am wake ups. For the first month or so, behaviors dramatically improved: no more head banging, increased attention, less frustration and impulsivity. But it's not perfect. Moe seems upset many mornings, and the last week or so, we've seen some gradual increase in behaviors. We're taking data, and may increase the dose if necessary. Most importantly, we found a doctor we like, who knows kids like Moe and wants to help. We are watching for the side effects, the most common of which is increased appetite leading to weight gain (and perhaps some link to increased blood sugar and diabetes). But so far, he's doing okay. What else is going on? We finally decided on a kindergarten for Jelly and are excited about the start of the new year in just 5 weeks! I cleaned out the enormous amounts of clutter in her room (she saves everything), went on an Ikea shopping spree, and set up a new "big girl desk" area in her room, complete with pink chair, and many pink accessories, as well as an "Elsa blue" lamp. She's growing up so fast, and while each year with Moe seems hard-won, some days I feel I can hardly remember so much of Jelly's life. I have a lot of things to say about a lot of things: Jelly's evolving relationship with Moe, life at a start-up in Silicon Valley, how we're doing with AAC (hint: we need a new approach), the intense feelings that come with living with a very aggressive child, the insantity of the Bay Area housing market. But this post has gone on too long already. If you read this, thank you. If you'll be at BlogHer this year and want to meet up, send me an email to wantapeanutblog [at] gmail. I'll be at the special needs MiniCon as well.